Replacement teeth supported by dental implants function so well and last so long because, like natural teeth, they are securely anchored in the jawbone for maximum support. In order to benefit from this remarkable technology, however, you need to have enough tooth-supporting bone in your jaw to hold a dental implant in place. Unfortunately, after tooth loss, the surrounding bone almost always deteriorates — decreasing in width, height and density — and this process starts immediately. The longer a tooth has been missing, the more the bone that used to surround it resorbs (melts away). If you want a dental implant but don't have enough bone to support it, can anything be done? Yes. Very often you can still get the replacement tooth you want, thanks to routine bone grafting procedures. 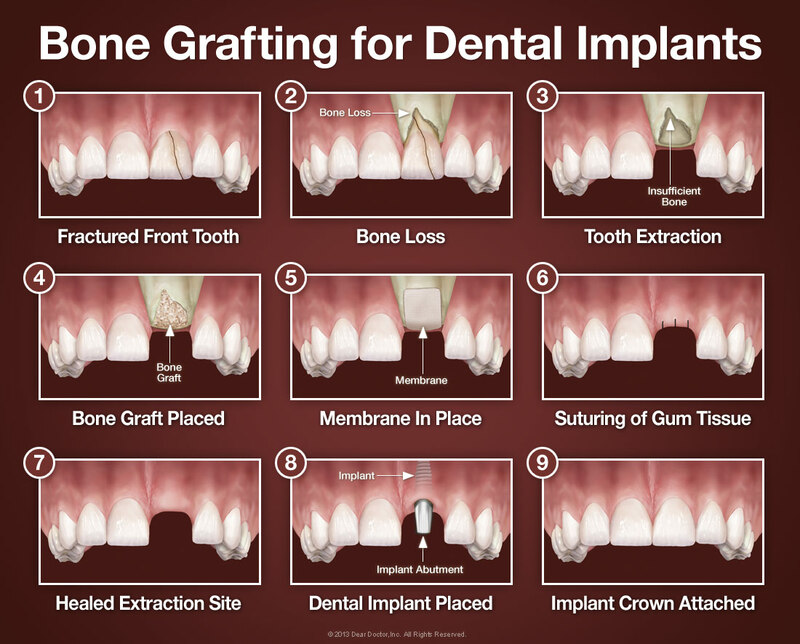 Bone grafting, normally a minor surgical procedure done in the dental office, is used to build up new bone in the area of your jaw that used to hold teeth. A small incision is made in your gum to expose the bone beneath it, and then grafting material is added. Most often, the grafting material is processed bone that serves as a scaffold, around which your body will actually deposit new bone cells. The grafting material will eventually be absorbed by your body and replaced by your own new bone. The grafting material needed can come from a variety of sources. Sometimes it comes from your own body. Very often, however, it is bone from an animal or human donor that is processed by a laboratory to make it sterile and safe. Grafting material can even be synthetic. It comes in a variety of forms: powder, granules, putty or even a gel that can be injected through a syringe. 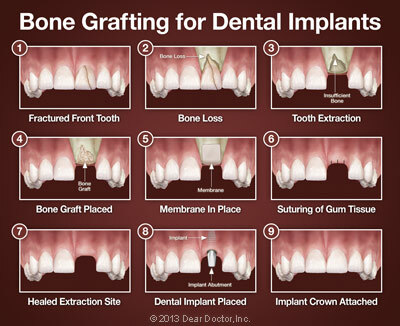 There are a variety of sources of bone grafting material used for preserving or augmenting bone for dental implants. All of these bone grafting materials are backed by significant research. They are processed (except autografts, which do not need processing) so that they are safe to use, eliminating the potential for rejection or disease transmission. Autograft: If you are already familiar with the concept of bone grafting, an autograft is probably what you're thinking of: taking bone from one site in your body and moving it to another. This is the only type of bone graft that involves creating two surgical sites: the one from which the bone is harvested and the one where it is deposited. Allograft: This refers to laboratory-processed human bone from a deceased donor that comes from a tissue bank. Xenograft: This bone grafting material comes from an animal — usually a cow. Alloplast: This type of graft uses synthetic (man-made) materials. The procedure for placing a bone graft usually requires only local anesthesia, though oral or IV sedatives can also be used to achieve a higher state of relaxation. Because a small incision in your gum tissue needs to be made to access the underlying bone that will receive the graft, you may experience some soreness in the area after the surgery; this can usually be managed by over-the-counter anti-inflammatory medication and/or pain relievers as well as ice therapy after the procedure. Though you will soon feel completely back to normal, it may take your body up to seven months for bone maturation to take place to receive your dental implant. The waiting time allows the healing process enough time to achieve the desired result: ideal support for replacement teeth that look great and will last a lifetime.